Long time no OyatsuBox! Unfortunately due to a postal mixup I didn’t receive May’s box, but I’m back for my regular monthly OyatsuBox reviews! 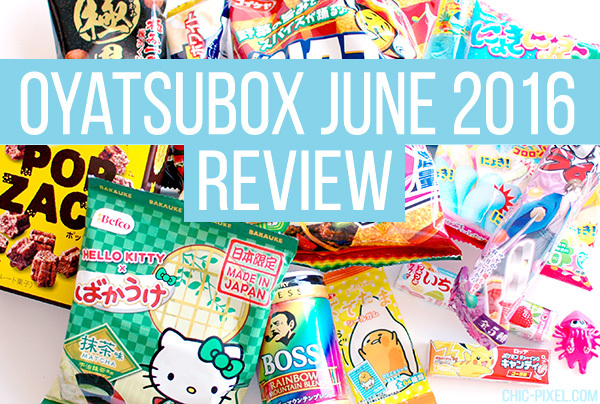 July may be nearly over, but today I’m going to be reviewing June’s awesome box, which included OyatsuBox’s first ever drink. 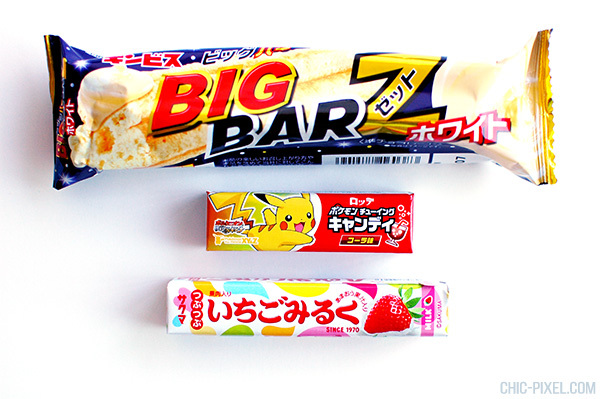 Read on to see what kinds of Japanese snacks, candy, and other goodies await for monthly OyatsuBox subscribers! As the Premium OyatsuBox, this version costs $35 and includes 6 items that are only available to Premium box subscribers! 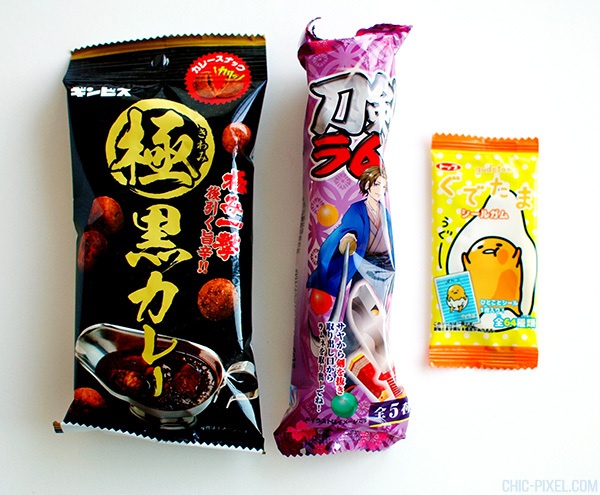 This month, the premium items were the Pop Zack, Nyokinyoki Kororon DIY kit, Ramune Blue Hawaii candies, Hello Kitty Senbei, Gudetama Gum, and Rainbow BOSS coffee. With two character-themed goodies and a drink included in June’s Premium lineup, you really do get a lot of bang for your buck! These first three items were included in all three OyatsuBox sizes. I’ve had Big Bar Z before, but not the white chocolate version, so I was quite interested to see how it tasted! My verdict is: very good, though I tend to prefer milk or dark chocolate. Big Bar Z is great because of it’s puffy, crunchy texture. Not something you usually associate with chocolate! Finally, for some reason I expected the strawberry milk candies to be chewy, so I was quite surprised when they turned out to be hard! I always love strawberry-flavored things, though, so these were great! The taco-flavored chips, which are apparently a limited-edition flavor, were so tasty I devoured them immediately! 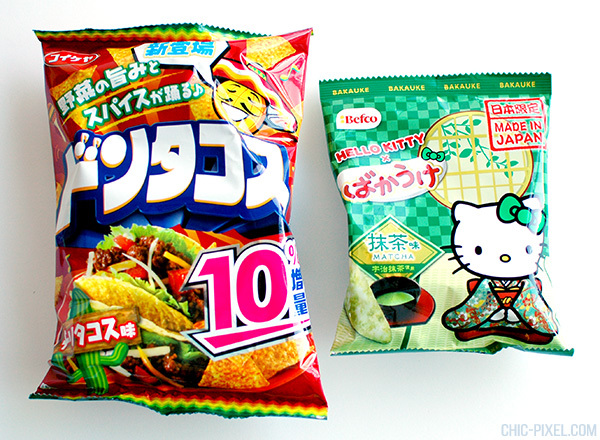 The real highlight of this image, though, are the matcha Hello Kitty senbei – check out the adorable packaging! I haven’t had a chance to try these yet, but I love senbei, so I’m sure they won’t disappoint. 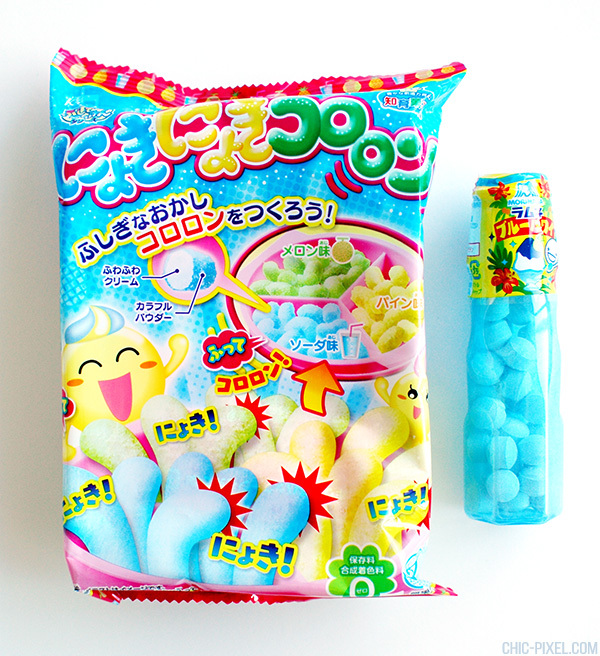 Next we have the blue candies, which includes Blue Hawaii ramune tablet candy and a squiggly DIY candy kit. I mentioned earlier that I don’t really enjoy ssoda-flavored candy, but ramune is somewhat of an exception… Especially these Blue Hawaii candies, because I loved them! The soda was mixed with pineapple to create a really nice flavor. The Nyokinyoki Kororon DIY kit looks like it will be lots of fun to try! This kit comes with three flavors, melon, pineapple, and ramune. This image features what was hands-down my favorite thing to eat in this month’s OyatsuBox! Can you guess which one? It’s the black curry puffs on the left! These had an amazing dark curry flavor that was apparently achieved with 15 different spices. I just loved them! I was also super excited to find a Gudetama item in the June Premium box! This is a packet of gum, but the real highlight is the special Gudetama sticker it comes with. The gum was surprisingly tasty, though! 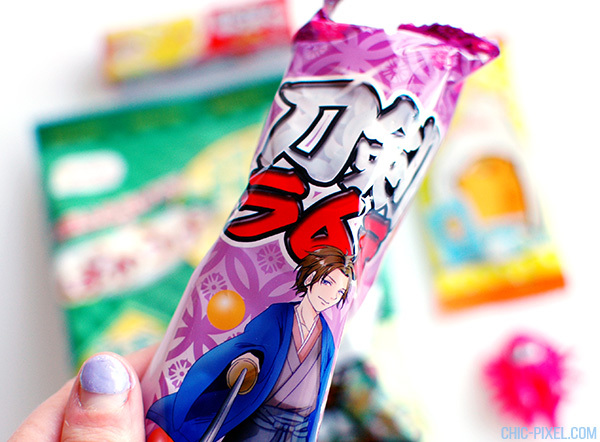 I may not be a big fan of ramune candy, but any candy featuring a cool anime guy gets an A+ in my book! 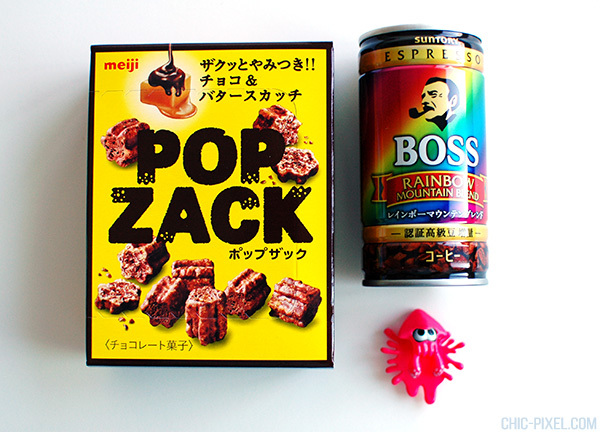 Finally, we have the Premium Pop Zack, BOSS Rainbow Mountain Blend coffee, and an adorable Splatoon gachapon! I was thrilled to find a Splatoon item in this month’s box, and even more thrilled that mine was pink! It’s a headphone-jack plug, so I might stick it on my 3DS… If you posted a photo of your Splatoon headphone jack in action using the hashtag #OyatsuBox, you were entered to win a $30 OyatsuCafe gift certificate, too! OyatsuBox continues to impress with lots of great items every month! The drinks are a great addition, and I always love getting limited edition and character candies. I already have the July OyatsuBox waiting to be opened on my shelf, so expect another review soon! Chic Pixel is a monthly OyatsuBox reviewer. While I was provided a Premium OyatsuBox at no charge, this review reflects my authentic opinion of the product.